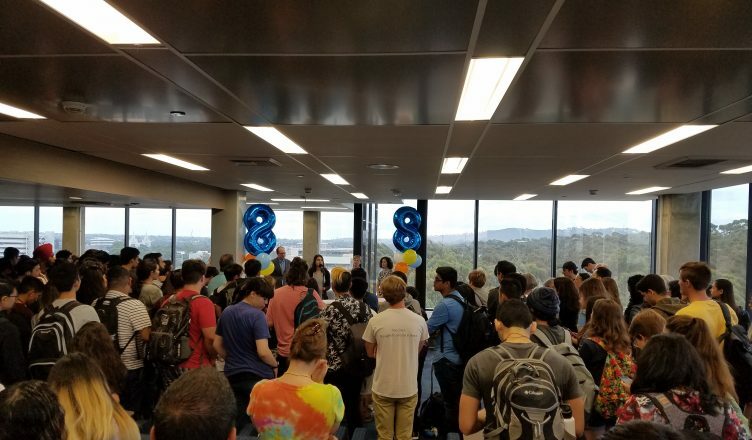 The eighth floor of Geisel Library reopened during a commemoration ceremony held on Monday to celebrate the refurbishment of the floor to update the facilities. Closed for construction since September of 2017, the renovation is the most recent phase of the Geisel Library Revitalization Initiative — a long-term plan to update the library’s most-used spaces. Students at the reopening ceremony gathered together in a cordoned-off section of the floor to hear University Librarian Erik Mitchell acknowledge the work that has gone into the renovations and redesign. Mitchell thanked the Library Student Advisory Committee for being “instrumental in helping pick the layout and the furniture,” and thanked A.S. President Kiara Gomez as well. Gomez, addressing those in attendance, highlighted the library’s efforts to involve students in the process. “Students were at the center of the conversation because we spend countless hours in this lovely building,” Gomez noted. She also noted that the library, as well as its many resources and staff members, played a crucial role in students’ developments and ventures. After the ribbon was cut, visitors were able to roam about the top floor of the library to admire the new furniture and take part in various activities. Stations were set up where students could receive a chair massage from FitLife, build their own zine, get snacks, and take pictures in a green-screen photo booth. There was also a number of raffles that students could enter for prizes such as bookstore gift cards or new Bose headphones. Mitchell pointed out additional power strips at the tables, as well as new Wi-Fi nodes for more comprehensive internet coverage on the top floor. One librarian told the Guardian that students commonly complained that the restrooms were “scary,” and that with the help of student input, the restrooms and water fountains have been renovated. The number of seats on the floor increased from about 140 to 176, while also leaving enough space to move around the floor. In order to conserve energy, the UV film has been redone on the windows to help keep the building cooler during the day, reducing power usage. The eighth floor also utilizes LED lights, which dim automatically when nobody occupies the space. Executive Vice Chancellor of Student Affairs Elizabeth Simmons also spoke briefly, pointing out the visual crossroads that are highlighted by the vantage point the eighth floor affords its visitors. The next phrase of the GLRI, scheduled to begin in the 2019-20 academic year, will involve the renovation of the first and second floors of the library.